White Paper Abstract: As evidenced by CMS' ongoing Bundled Payments for Care Improvement (BPCI) initiative and closer scrutiny of skilled nursing facility (SNF) readmission rates starting in 2018, healthcare is honing new post-acute care (PAC) delivery and reimbursement models that result in higher quality and more coordinated, cost-effective care across the continuum. Acutely aware of this imperative, 95 percent of respondents to a July 2015 survey on Post-Acute Care Trends have amped up efforts to improve quality and reduce costs of post-acute care. In new market metrics from the Healthcare Intelligence Network (HIN), care transition management, development of PAC partnerships and integration of all PAC services are the top tactics deployed to achieve this goal. 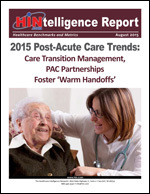 Download this HINtelligence report for more data on the top challenge for the post-acute market, the most challenging condition to manage in post-acute care settings, strategies to improve post-acute care quality and costs, the top post-acute care improvement tools and much more.